I have always thought of the Decatur Art Festival as the beginning of the summer! It does, after all, take place Memorial Day weekend wich the Decatur Art Walk kicking the festivies off. Taking place on Friday, May 25 from 5-10P, many business in downtown Decatur will feature artists. Because of my represention at The Seen Gallery, I was invited to display my work at the Cook’s Warehouse, located on Ponce De Leon Avenue. In fact, the pieces featured above will be on display on Friday night. 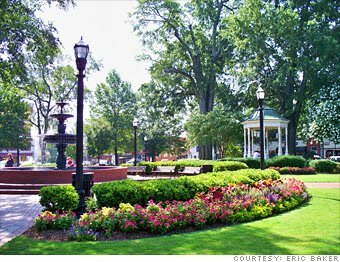 Decatur has managed to keep it’s small town atmosphere, while tapping into the sophistication of being part of a major metropolitan area as well as being a college town. 3. 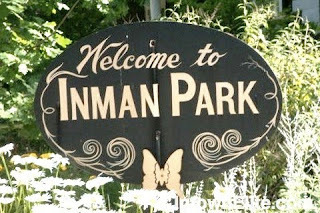 It was founded at the crossroad of two Native American trails. 4. When the Western and Atlantic railroad wanted to make Decatur the southernmost stop on their line, the citizens of Decatur said no, and Atlanta was founded 6.2 miles Southwest. 5. And, most importantly, Decatur is my home! So, come out on Friday and enjoy a leisurely walk around the Decatur square, Be sure to stop into The Cook’s Warehouse and say hello! 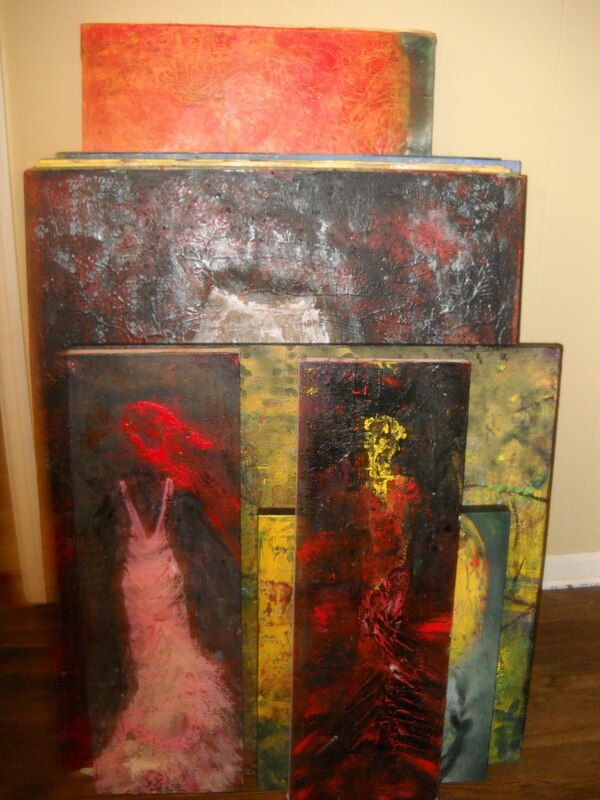 This entry was posted in Around Atlanta, My Exhibitions on May 21, 2012 by vickiemartin. I don’t know if getting your mom a gift for Mother’s Day is as hard for you as it is for me. My mother insists she doesn’t want anything. While I can always give her a plant or flowers, I feel I’ve overdone that over the years. A couple of years ago I tried getting her a gift certificate to a restaurant she likes to go to. Wouldn’t you know – six months later while we were out, she wanted to go to that restaurant and then whipped out the gift certificate I had given her. I tried giving her a gift card to a grocery store, and I still don’t know how that gift card landed back in my purse!I think most mom’s like to get things handmade. But, if it is already too late to start on something of your own, or you aren’t a artsy craftsy kind of person, I know of a place you can go! I suggest you head over to InsideOut Accessories, located in Vinings Jubilee. InsideOut is an artisan boutique, carrying everything from jewelry to original paintings (mine included), pottery, glassware, fiber work, wood work and much more! Everything in the store is original and is created by artisans that live in Georgia! This delightful store is owned and operated by D’Ree Harris, who will say she is not an artist, but she does have an eye and a deep passion for art. She spent 23 years in radio finance and human resources, most recently the Corporate Controller of WQXI-AM radio in Atlanta (that is another story, as I am a media buyer, and we did not meet in the world of Atlanta radio!). When WQXI-AM was sold, she decided to take a chance and pursue something she really loved, and thus InsideOut was born! To say Atlanta is a festival town is an understatement. Beginning mid-April, there is virtually a festival somewhere within metro Atlanta every weekend through mid-November. On some weekends there might be as many as four or five festivals. The crowds are HUGE, the prices are high and parking is always a premium. This shop is a welcome an alternative to the festival scene, and many of the artists in the store are from the festival circuit. Parking is not a problem, and the pace is relaxed. There are many things to choose from in the store, and as stated previously, everything is handmade in Georgia! By supporting this, you are also supporting the 3/50 PROJECT, you have not only supported a locally owned business, but the artists that are in the store! The store is open seven days a week! This entry was posted in My Exhibitions on May 3, 2012 by vickiemartin. I am amazed how wonderful this show ended up looking after it was hung. Having a store front window, along with great lighting (thanks Bill Bibb!) added to the drama of the work. I have to admit I am proud of the way it turned out! 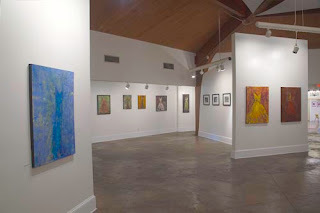 The Seen Gallery is conveniently located on Church Street in Decatur, Georgia. There is ALOT of foot-trafffic along here – this area is a real foodie destination. The award winning Cakes And Ale (recently winning a James Beard award, as well as awards from Food and Wine Magazine) and Leons Full Service are loccated across the street. The show will be up until the end of March, so make Decatur your destination during the next month and stop in and see my solo show! 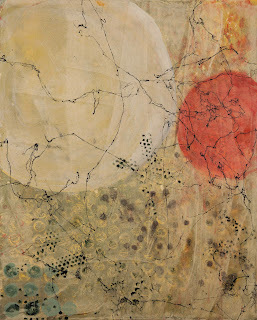 This entry was posted in My Exhibitions on February 26, 2012 by vickiemartin. FOUR EVENTS FEATURING MY ARTWORK THE WEEK OF FEBRUARY 6th! February is usually a slow month in the world of art. My plans were to organize in January and February, update my website and set up a good inventory system – and then start a new series and experiment with new techniques. Also, January and February historically is my busiest time in the year for my day job – and I tend to work 50+ hours a week during this time, not leaving me much time for my art! But something happened, and the week of February 6th has me attending FOUR events that will feature my artwork in and around Atlanta. Starting with Monday February 6th, which is the opening of the 30th annual Spotlight on Art, an invitational fundraiser for the Trinity School, located on Northside Drive near the Chattahoochee River. A weeklong event, it begins with the Opening Reception 6p-9p on Monday and going through Saturday. It features 350 artists – – all invited to be a part of this show. I will have three pieces on display here. Up next, on Thursday February 9th. 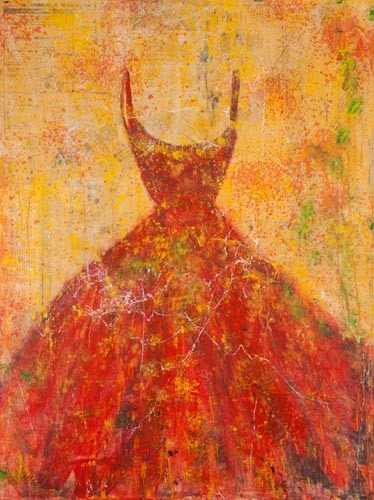 InsideOut Accessories located in Vinings Jubilee will host an evening with the artists from 5-9p. This is an artisan boutique that features everything from jewelry, metal sculptures, glasswares and much more. This is a good destination to find that one of a kind Valentine’s Day gift, as everything in the store is handmade by Georgia artists. In addition to what is usually on display in the store, I will have several small original paintings that would make a great Valentine’s Day Gift, as small at 3″x3″ to 24″x36″. February, Friday, February 10th. 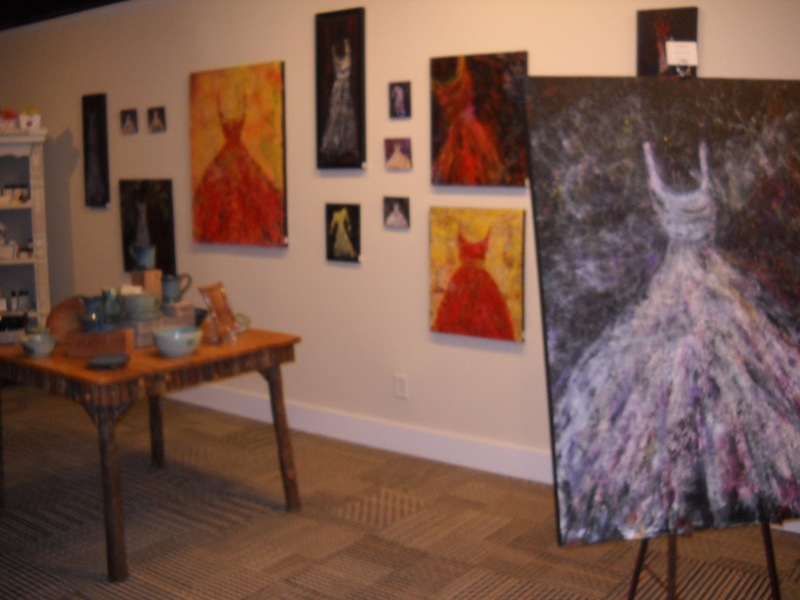 Emerging Art Scene, located in Castleberry Hills will be open 6-9p as part of the monthly Art Stroll. My work will be exhibited as part of the Valentine’s show! AND, finally, The Seen Gallery, located on Church Street in Downtown Decatur will feature my work beginning on February 11th. An opening reception will be held on Saturday February 11th from 7-10p. The painting below will be featured in this show. The show is tentatively titled Journeys. Hope to see you at one of the events the week of February 6th. I have not entered into any festivals this year, so this is the only chance you will have for awhile to see my work. Of course you can always visit my studio!!!! This entry was posted in My Exhibitions on January 29, 2012 by vickiemartin. Journeys, here and there and back again at the Defoors Center – shot in HD! My show is finally up!!!!!!! We have gotten good press and alot of attention. Today there is an article in the Northside Neighbor – Female artists highlighted in Buckhead Art Exhibit!!!! I hung 70 pieces this weekend. Joel Conison photographed the exhibit in HD – click HERE to not only see my show, but see how great the photographs look!!!!! It is a great venue – 5500 square feet, 30 foot ceilings! 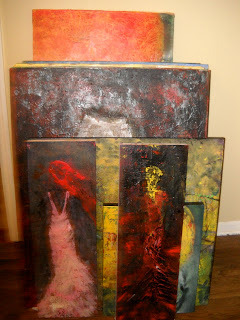 This entry was posted in Joel conison, My Exhibitions on June 15, 2011 by vickiemartin. I feel like I have been the absent friend of late, and I owe my friends an apology. Committing to a show of this size in The Forum at the Defoor Centre has taken up ALOT of my time, and I have not been keeping in touch with people as I should. That doesn’t mean I haven’t been thinking about my friends, I just haven’t been communicating. I promise, when this show is up, I am going to be back!!!! I might even socialize again!!! Jill Kettles, of Scribbles Studios contacted me last year and asked if I wanted to do a show in the Forum. I readily agreed. The Forum is a fairly large space and I knew I had alot of work to do. 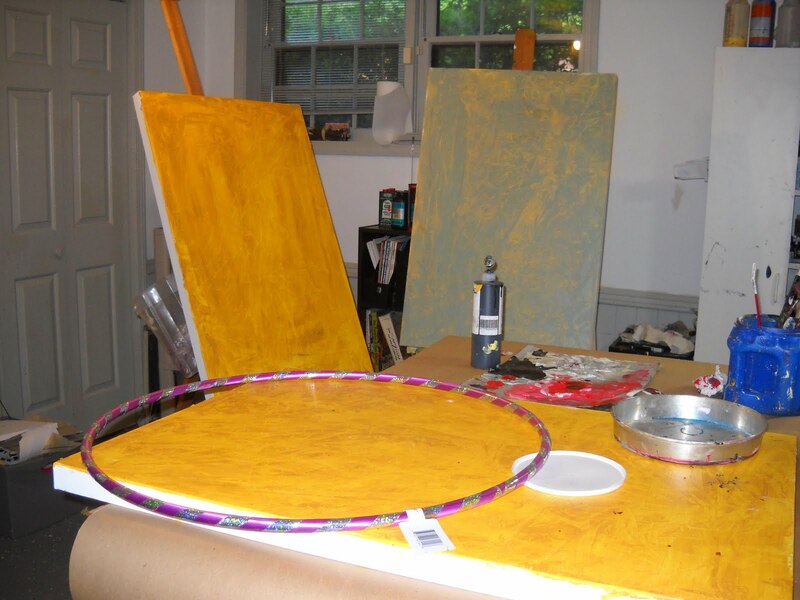 I wanted to paint larger for awhile and had been collecting canvases. This was the opportunity to do this and work on larger works in a couple of series. Because the room has dividers, I feel I can hang 2-3 series and still make it look cohesive. as well as the Northside Neighbor (which didn’t have a link). I’m excited to be showing with several of my friends (we all have separate rooms), Laura Parker and Tina Ciranni, as well as Lisa Stevens and Ruth Gogel. Jill was able to get Ike Stubblefield as the musical guest. He has played with people such as Eric Clapton, B.B.King, Boz Scaggs, The Pointer Sisters among others. So – what do I have ready to show at this? Here are 24 pieces that are finished, except some of them still need wires and the edges finished. The largest piece here is 36×48 – my largest piece yet. Shown here are 14 pieces that are finished, but will be photographed prior to hanging. Here are the framed pieces – 14 in all. 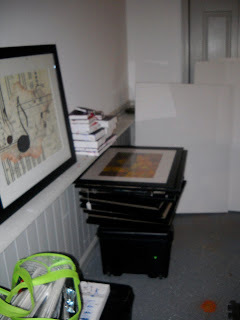 I have 2 additional pieces to be framed – 16 in all. Three pieces in progress, and yes – I am using hula oops and baking pans!!!! 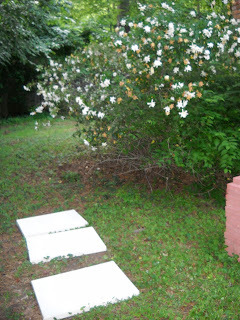 And – I have a few more I have begun that have been drying by the gardenia bush – which as you can see is in full bloom. The reception is on June 19th – 2-4p, and is open to the public at the Defoor Art Center, located at 1710 Defoor Avenue, Atlanta, Ga. I really believe this opening will be fun!!!! Not only will the entertainment be great, I think the refreshments will be worth the trip – and – – – The Defoor Art Center is haunted! This entry was posted in My Exhibitions on June 1, 2011 by vickiemartin. 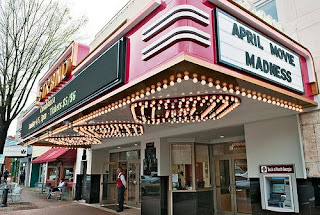 Mayretta Days, and other amazing things about Marietta, Ga. I am excited to be a part of the 34th annual May-Retta Daze Festival taking place this weekend 5/1 and 5/2. Located around beautiful Glover Park (pictured above), my booth will be located on Cherokee Street, down the street from the beautiful, refurbished Strand Theater. While there, check out Traci Browning’s stunning photography and the feel good and green work of Laura Wellem. You just might find your next masterpiece at Mayretta-Daze! This weekend marks the opening of the Marietta Square Farmers Market which takes place on Saturday between 9a-12n. This is your chance to buy locally grown food, and locally produced delicacies, such as organic dog biscuits, lcoal honey, soaps, candles among some things available. While there, make sure you stop by the booth of my brother and sister-in-law (Scott and Glendy) and sample their wonderful Jalopy Jelly , jellies made using jalopenos, mangos and peaches. 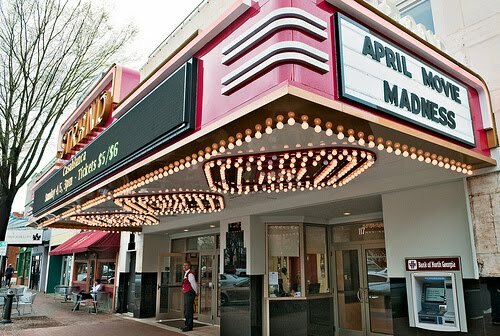 Make a day of your visit to historic Marietta. 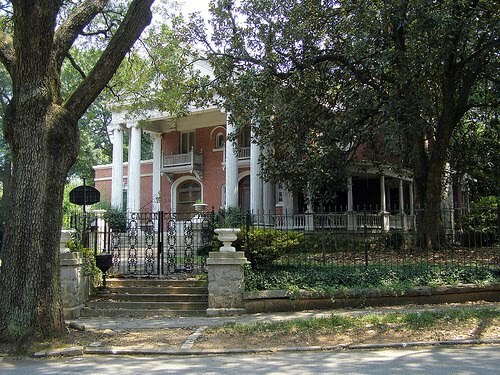 Also near the square is the Gone with the Wind Museum, the Marietta/Cobb Museum of Art or the Marietta Museum of History. What is “May-retta” you may ask? Apparently this is considered the traditional pronunciation of the city Marietta, which is currently pronounced as Mary-etta. 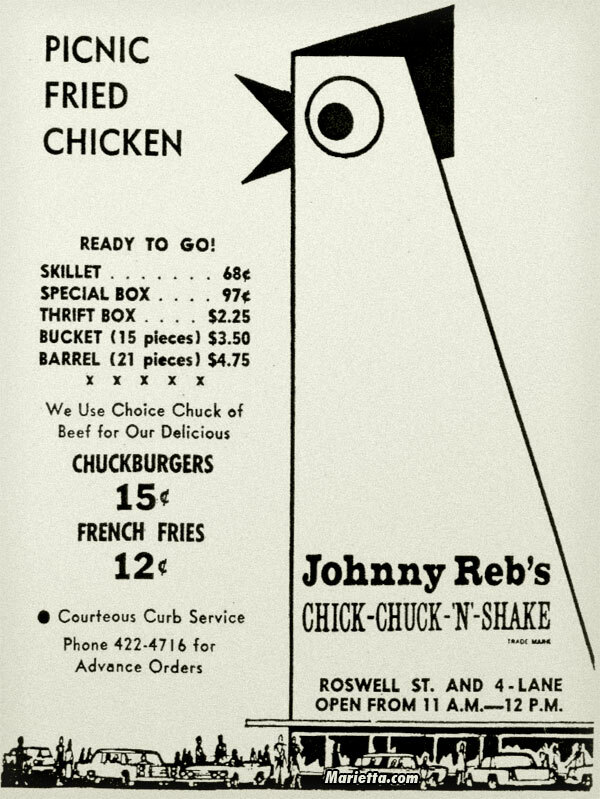 However, I grew up in Marietta, and I rarely heard it pronounced May-retta by natives! Marietta is older than Atlanta, with the first plot laid out in 1833. 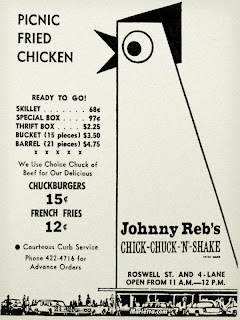 It is the county seat for Cobb County, named for US Supreme Court Judge Thomas Willis Cobb. Marietta is named after the wife of Judge Cobb, Mary Cobb. The town was selected at the base for the Western and Atlantic Railroad. John Glover arrived in 1948 and was elected mayor, when it was incorporated in 1852. Glover Park is named for him. During the 1850’s, fire destroyed much of the city three times. Sherman invaded Marietta in the summer of 1864, and General Kilpatrick set fire to it in November of 1864, beginning Sherman’s March to the Sea. Leo Frank was lynched at Frey’s Gin in 1913 (which was located across the street from my kindergarten), allegedly for the murder of Mary Phagan. This incident led to the founding of the Anti-Defamation League. No one was ever prosecuted for the lynching, but rumors have long hounded Marietta families. Read more of the story here. On Halloween, 1963, Atherton Drugs (located on the square) exploded while people were shopping for their costumes. Attributed to a build up gases, 6 people were killed. I remember everybody going downtown and standing silently around the empty shell. Across the street from The Big Chicken was The Thrift Market, which eventually became K-Mart. 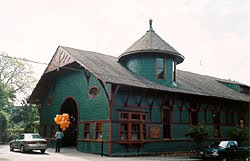 I remember going to the grand opening and watching the ribbon cut by Jayne Mansfield. There are other memories, Parkaire Field Airport, Varner’s Drive-in Restaurant, the list goes on and on. So – come out this weekend and visit historic Marietta, and stop in to see me, Scott & Glendy, Traci and Laura!!!!! This entry was posted in My Exhibitions on April 28, 2010 by vickiemartin. THE HIGH PROJECT was an experimental collaboration between one dancer and two local abstract artists while creating a three-dimensional canvas. I was one of the painters, along with my friend Lance Carlson. This was organized by Heather Harper, the Artistic Managing Director of the Harper Continuum Dance Theatre with Stacey Perkinson dancing. The artwork was painted live while the dancer moved between the two canvases. The canvases were made of spandex, which allowed the dancer the freedom to move within the actual material. This was a fun project, but because it was at the High Museum of Art in Atlanta, we were restricted by the materials we used. In the end, we used primarily washable tempura paint. After alot of experimentation, we found watered down food coloring in spray bottles, as well as food coloring in shaving cream worked well too. We were also allowed to use charcoal. The piece featured abaove is my finished piece. 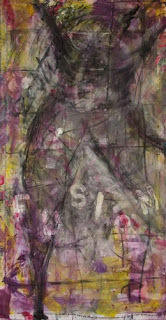 When I started seeing a figure developing I concentrated on channelling DeKoonings large women paintings! We hope to repeat this at a future date – Heather has been contacted from as far away as Idaho with interest in the event! 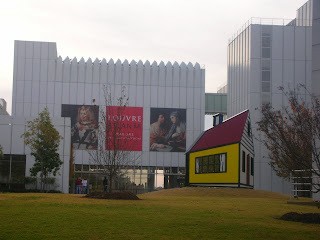 For those of you not familiar with the High Museum of Art, it was founded as the Atlanta Art Association in 1906. 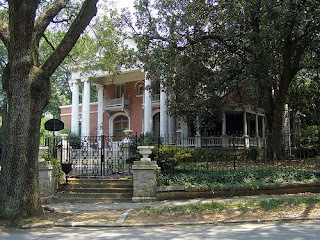 Two decades later, the High family donated their family home on Peachtree Street , thus the name The High Museum! It now houses over 11,000 works of art in its permanent collection. This entry was posted in My Exhibitions on February 21, 2010 by vickiemartin. I am excited about my upcoming project with the Harper Continuum Dance Theatre (click here) and the High Museum of Art. 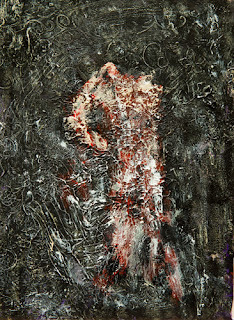 This is an experimental collaboration beween one dancer and two painters while creating two canvases made of spandex. 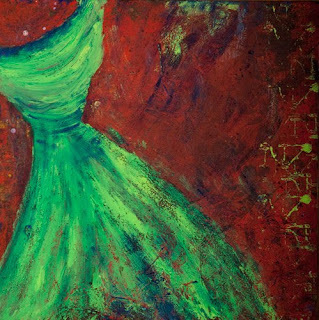 The painting will be live and the artists and dancer will explore the connection between both movement and composition. The event will be January 23rd at the High Museum of Art and take place in the atrium (of the original High Museum) . How did this happen? . Heather has recently relocated to Atlanta and is starting a dance company. To begin this process and gain attention as a choreographer, she is looking for new and different ways to approach dance. 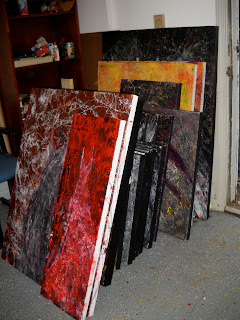 She saw my website and liked the rhythm and movement in my paintings. I found the project very interesting. I searched and searched the web, but couldn’t find anything like it. So -not one to back down from a challenge, I readily agreed to be part of the project. I am happy my painting buddy and friend, Lance Carlson, is going to participate too because of his use of gesture, color and of course his speed!!!! So, this project is exciting, and I am excited to be a part of this. But the countdown is here and we are scrambling to get organized. The High Museum has very strict rules about what materials we can use and the more we get involved the more restrictive they become. But, in the creative spirit, we are all trying out new and different mediums. I have experimented with Tumeric, Beets, coffee and tea. Unfortunately, these materials just stained the canvas. Then I experimented with food coloring, which had much better results. Today I used shaving cream and added watercolor and food coloring and was happy with the results! Tomorrow I may try whipping cream! So, check back and see our progress. If you have any suggestions, or know of anything like this that has been done, please leave a comment! This entry was posted in My Exhibitions on January 4, 2010 by vickiemartin.